An analysis of the normalised rainfall intensity curves in Barcelona (NE Spain) has been undertaken from selected rain rate episodes recorded by an urban network of tipping buckets applying a 5-min integration time along the years 1994–2009. These curves, based on cumulative amount and time distributions, are modelled by a power law, this fact suggesting fractal behaviour. Four parameters characterise these curves. One of them is the exponent of the power law. Another one quantifies the intermittency of the rainfall along the episode. The other two are the coordinates of cumulative amount and time distribution from which the power law fits well the normalised curve. The total rainfall amount of the episode, its length and the coefficient of variation of the 5-min amounts are also considered as complementary parameters. Taking advantage of these seven parameters, patterns of rainfall intensity are determined for every episode. These patterns, together with the statistical distribution of 5-min amounts, maximum intensity and rainfall intermittence, should increase the knowledge on the urban rainfall regime with the aim of improving drainage design. In addition to present results, flood prevention should be complemented with extreme value analyses and quantification of return periods. 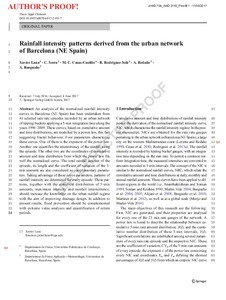 Lana, F.J., Serra, C., M. Carmen Casas-Castillo, Rodriguez, R. Rainfall intensity patterns derived from the urban network of Barcelona (NE Spain). "Theoretical and applied climatology", 21 Juny 2017.